update: we have since become concerned about children using these enamel pens necessary for this craft. 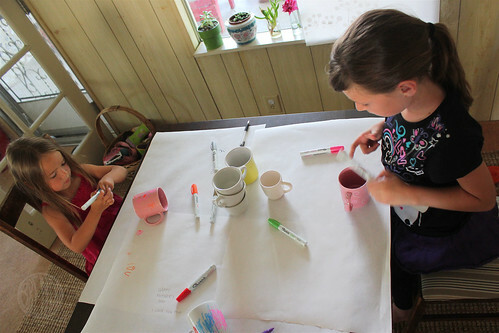 We are only leaving this craft up so that ADULTS can do it. 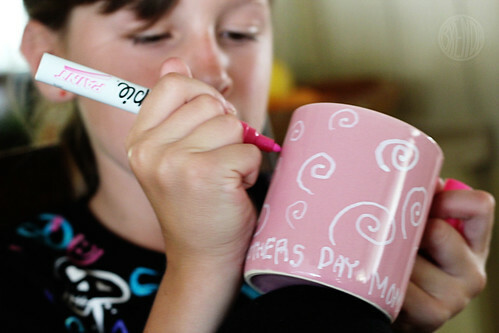 Mugs seem to be all the rage for Mother’s Day, much like ties are for Father’s Day, and why not? 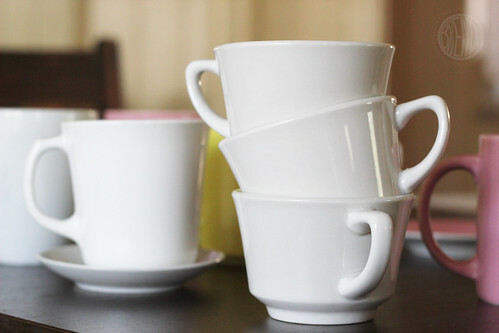 Mugs are useful for so many things besides just your morning coffee. I store pens in mine and clothespins too. I even have one stuck at the back of my underwear drawer for all those secret things I don’t want little kid hands getting into. Anyway, just because you want to give your mother a mug doesn’t mean you are stuck with cute cats and jokes in Comic Sans. 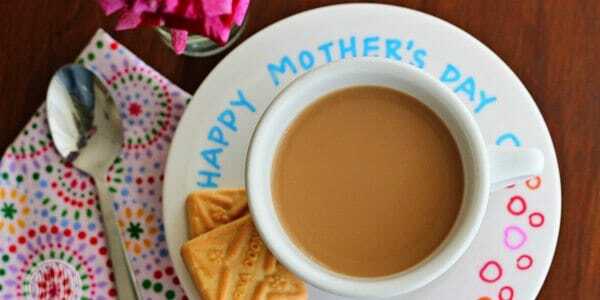 You can make your own cup for your mom that no other mother on earth has. With the recent availability of enamel paint markers at your local craft store, anything glass or metal can now be your own masterpiece with the flip of a marker-pen lid. First you’ll need your canvas. Ahem, I mean blank cup. We found a passel of them at our favorite thrift store for 50 cents each. Score! Pick out a shape that you think your mother or your kid’s grandmother (or you if you’re a mom and your kids are making this for you) will like. Colors and patterns are fine too. 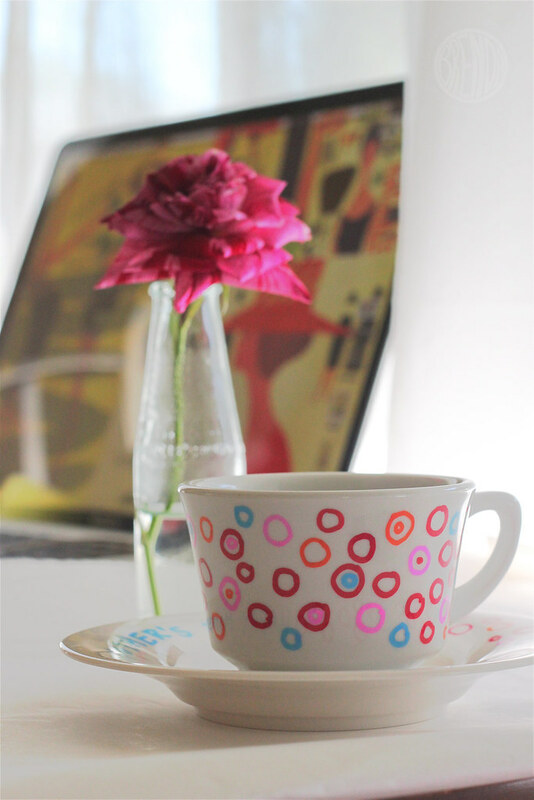 We didn’t do this personally but sometimes it’s fun to incorporate a cup’s design into your own art. Monsters eating fleurs de lis might just be your cup of tea! Now it’s time to break out the pens. You might want to prime your pens ahead of time because they do require a lot of shaking and depressing of the felt tip before the paint starts flowing. We turned on some music and did the Shaka-Shake-that-Funky-Pen Dance for several minutes before starting our craft. Porcelain enamel pens are not very messy but they are oil-based so you’ll want to take precautions and try not to get the paint on your clothes or furniture. Wearing aprons and spreading out some paper on your work surface is always a good idea. It’s very easy, they work just like normal marker pens just more permanent. Also they are more opaque than regular markers which is kind of fun since it’s not that often you get to color with white and have it show up. Let the kids go at it with their own personal message that will be captured until the end of time or until somebody breaks it in the dishwasher. 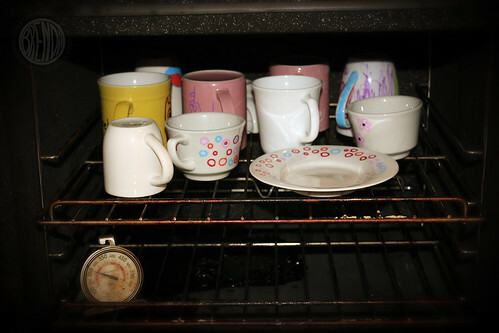 When you’re done coloring, pop them in the oven for 30 minutes at 300ºF to set the paint. After they cool, you’ll have your very own unique mug design that nobody else on the planet has. How special is that for Mother’s Day? Does your mom like owls? How about a “Whoooooooo’s the best mom ever?” mug! I know I’ll treasure this one forever. And here’s the one I made for my mom. I hope she likes it. I’m sad to report that after a couple weeks of using my mug and washing it in the dishwasher, the ink has started to peel off in places. 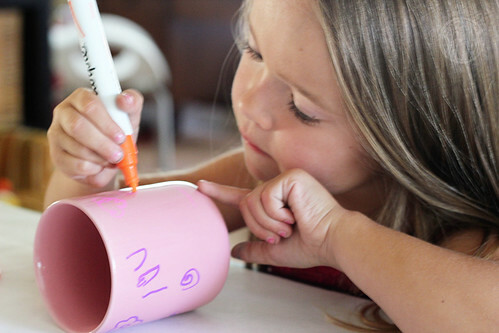 Personally, I still think this craft is pretty cool because now I can redraw something new on my cup, and hey I could make a birthday cup and write a new name every time… but this might dissuade someone else from this craft. So I just wanted to manage your expectations. What a great idea! 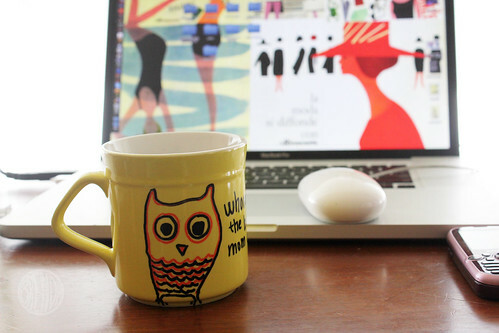 Love your owl mug, very vintage cool. I love it! 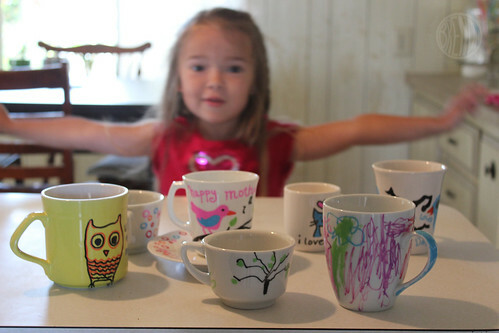 You know how much I love to paint things, but taking 3 kids to a paint-your-own-ceramics place is pricey! This, we can do! I’m going to Michael’s & then to a thrift store later! This is awesome! 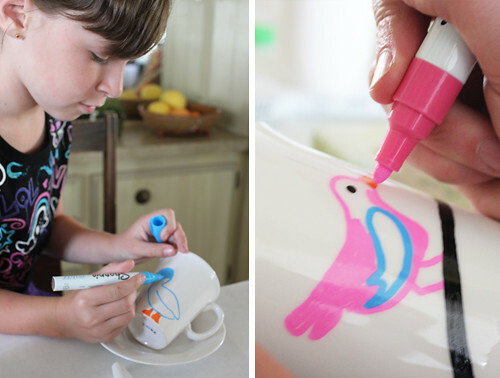 I would have never known to try out the pens…it’s like your own little pottery painting studio! What a fun thing to do with friends or for happys during the year, too. 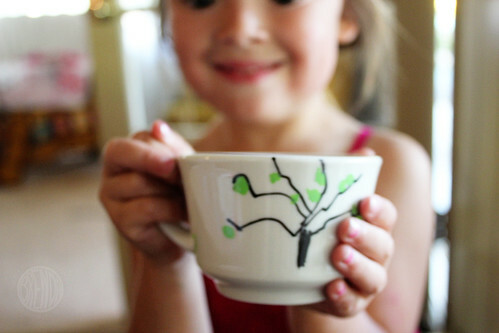 I did this using my baby’s handprints around the mug for Christmas gifts. They turned out so cute, but the paint definitely did not last like I expected it to. It is supposed to be dishwasher safe, but it started chipping the first time they were washed. Then, I switched to handwashing, and still more chipping! Did I do something wrong? Let me know if anyone has any suggestions for how to do it better next time! Hmmm! I don’t know. I’ve run mine through the dishwasher once and they seem fine. Time will tell. Did you set the paint by putting it in the oven? Wow, I love this!! Thanks so much for the idea. They are going to love it too! Pop over sometime and say hello! Just because I am being super lazy by not googling, is there a specific pen you would recommend…it looks like you have a sharpie version and I am guessing those can be picked up at your nearest big box craft store? No, that’s the only version I tried because that’s what my craft store had but I am keen to try other brands. Sharpie was a bit on the expensive side. Wow, what a great idea! I am going to hunt down these pens and try this out for myself. 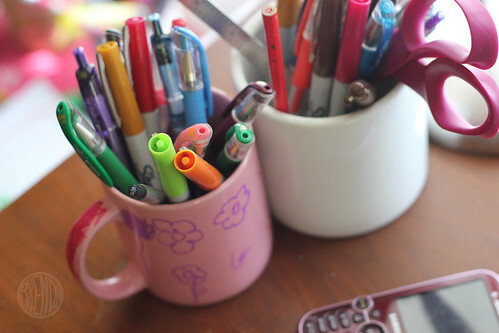 Where can u get the pen?…..